Ten days ago the ISS astronauts inflated the BEAM module, a new concept that may help (a lot) with the construction of large space stations, Mars and Moon exploration modules. 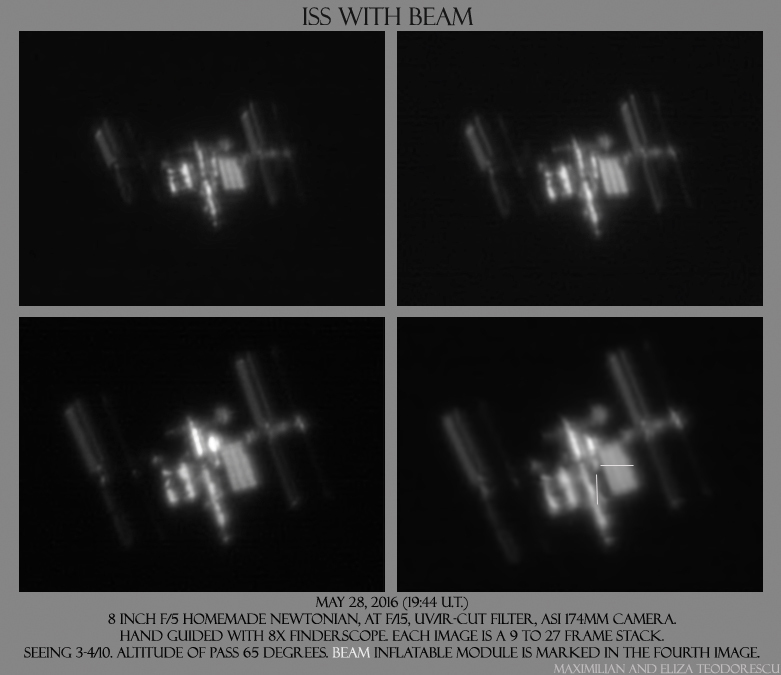 On the night of May 28 the ISS had a pass over my location at over 65 degrees above the horizon. On the same day the BEAM module was inflated, so I was hoping for good seeing to get a good resolution of this module. 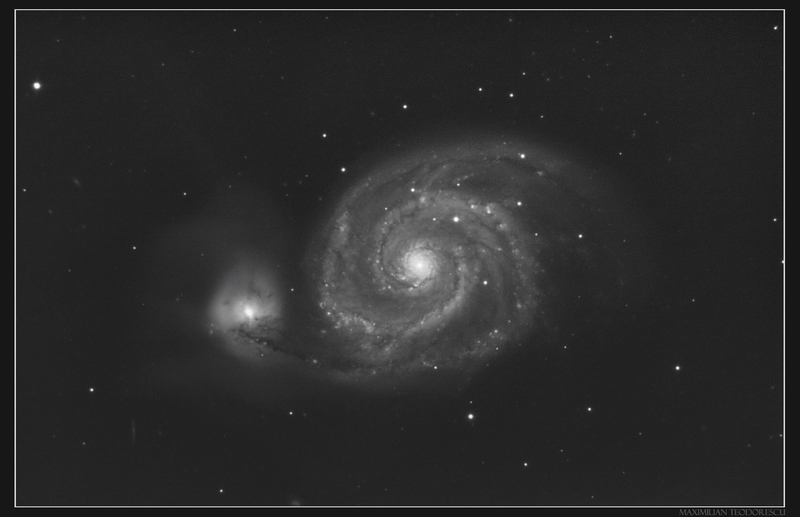 Together with my wife I’ve prepared the 8 inch scope and imaged the pass. Unfortunately, the seeing was bad, and thus the images are of poor quality. Nevertheless, some structural details are easily observed. 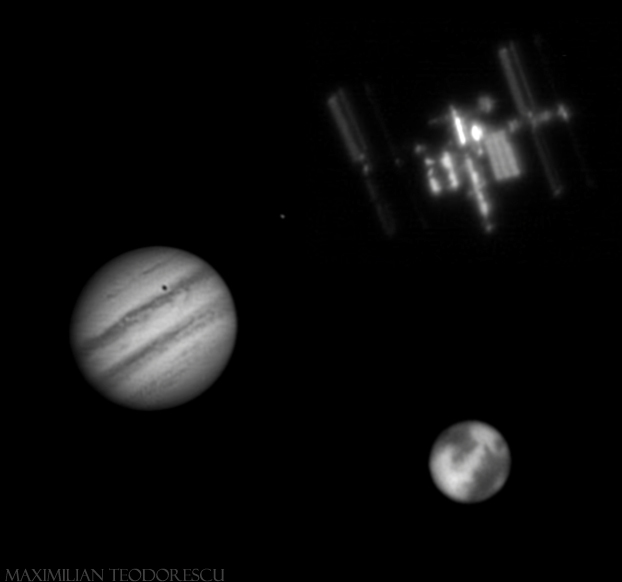 And another image, this time a test-shot from May 31, using the 14 inch scope and the ASI 174MM camera at the focal plane (F/5) with an UV/IR cut filter, and no coma corrector. 274 frames, each a 1 second exposure, were used for the image. A lot of light pollution and bad seeing, but details inside this wonderful nebula are discernible. This shot is the result of over 1000 frames, each a 4 second sub, acquired on a night with a lot of light pollution (like every other night for my location) and some humidity. The imaging scope was the 14 inch Newtonian at F/5, with the Baader MPCC mounted, and the ASI 174MM camera with no filter. Seeing was not the best in the world, and some ambient lights were also interfering with the acquisition. The result is a bit under my goal, but considering the conditions, it turned out alright. 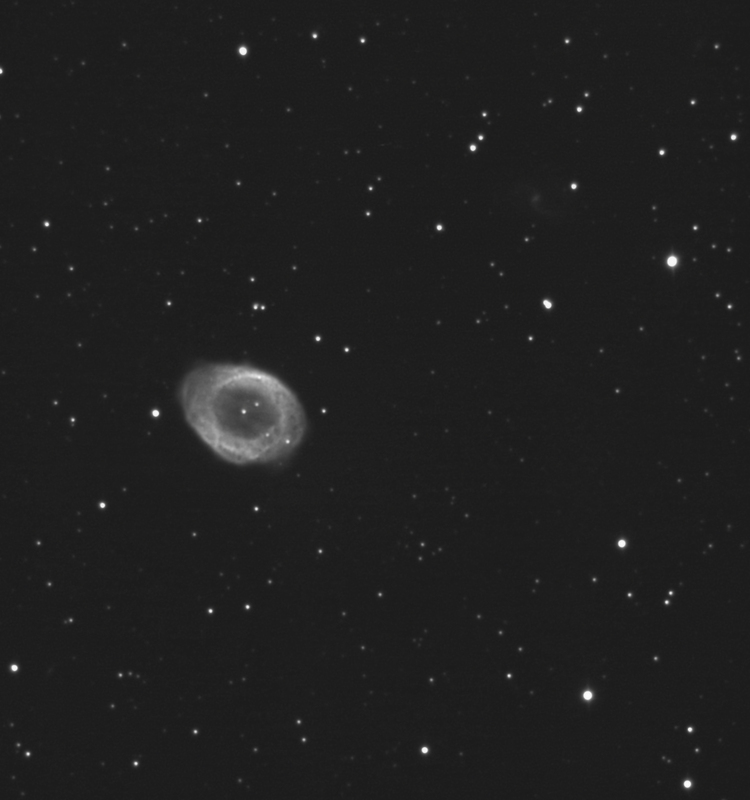 I will give this galaxy another try in more decent conditions. It is very difficult to observe Mars these days. Despite presenting a large apparent diameter (due to a rather close proximity to Earth) the Red Planet glides only around 22 degrees above the horizon at my location (45 degrees North). 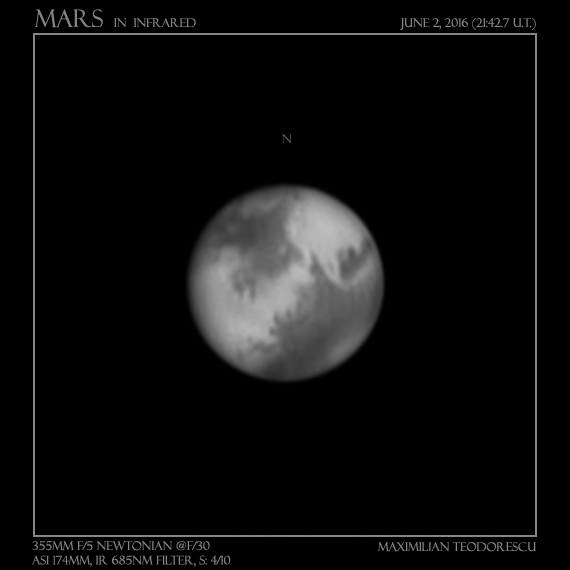 The atmospheric seeing is, of course, rather bad at that altitude, and thus imaging Mars is more of an exercise rather than trying to get the best details possible. And so, an exercise was conducted on the night of June 2, just days after the planet’s opposition. Following is the resulted near-infrared image.